Yesterday's blog entry on late guitarist Jerry Cole prompted me to revisit the issue of the popularization of psychedelic music. I say psychedelic music because to be perfectly accurate I think the word "psychedelia" names a larger movement than simply a musical one, that is, "psychedelia" would refer to trends not only in music but in the popular arts (such as poster-making), live concert performance (synaethesia), and so on. Since posting yesterday's blog, my thoughts have been preoccupied not only with how we have gone about defining psychedelic music but with how and in what way it came to be recognized as a distinctive kind of (serious) music in the first place. I've come to the conclusion that our own desires have much to do in forming the musical form we have come to call "psychedelic." I raise these questions because in yesterday's blog I mentioned that Jerry Cole's MySpace page indicates that the musician was "an architect of psychedelia," citing his "proto-psych albums" The Inner Sounds of the Id and The Animated Egg as indications of his contributions to the popularization of this form of music. But the more I have thought about it, the less satisfied I am with this claim, not because I wish to diminish his contributions to popular music, but because to my knowledge these albums were not recognized as seminal contributions at the time of their release. The problem is that we tend to piece together a history comprised of figures and works which largely reflect our own desires--and little else. Numerous websites exist extolling the virtues of rock albums--perhaps unfairly--that have been neglected in popular musical history, but we should remind ourselves that when we write our own history as a "corrective," we do not resurrect a "pure" past, but a past composed of imperfect memories, both on an individual level and on a collective level. Rewriting history to fit our own desires does not, alas, correct what is already an imperfectly written history. Surely there must be something more distinctive and more singular about what we call "psychedelic music" than the kinds of sounds resulting from "non-linear amplification," meaning that the sounds that come out of the speaker are not the sounds that go in. I'd suggested that Jerry Cole represented an important link between the West Coast surf/hot rod "reverb" guitar and the distorted (“fuzz”) guitar characteristic of early psychedelic music, but surely, I thought, there must be more to it than the role of the guitar. Obviously, developments in non-linear amplification contributed to the development of psychedelic music--the Leslie speaker and the ring modulator being examples of such technology--but there has to be more to its invention in the 1960s than the role of technology. Personally, I often find it hard to distinguish between what some enthusiasts name "garage band" music and what some name "psychedelic"; if "garage" and "psychedelic" both refer to a sort of recording engineered in a particular fashion, containing lots of guitar feedback, fuzz tones, and reverb, then we're inexorably entangled in a daunting language game in which our words are, literally, meaningless. It also occurred to me that psychedelic music itself was not immediately accepted (as in, "became popular overnight"); the audience for it had to be developed. Despite the great reverence we have for the music now--and the high prices some of these "historic" albums now fetch on eBay and elsewhere--early instances of so-called psychedelic music failed, largely explaining why so much early psychedelic music can only be found on obscure 45s, issued by independent labels, and budget LPs issued by Crown, Custom, and Alshire, to name a few such labels. In the 1960s, just as now, the major labels were only interested in the sort of product that adhered to the wall--the economics driving this procedure being to throw a lot of stuff at the wall and see what sticks, then package and sell the kind that sticks--and, frankly, very few early albums putatively containing psychedelic music sold very well at all. Why else are they now so hard to find and why else were they issued on minor or budget labels? According to wikipedia.org (by no means definitive), the first use of the word "psychedelic" in popular music was on the Holy Modal Rounders' single "Hesitation Blues" (1964), hardly a best seller. The harsh fact is, if it weren't for the soundtrack to Easy Rider (1969), the music of the Holy Modal Rounders would never have been known beyond a small coterie of enthusiasts and musicologists and students of the arcane. Of course, simply because the word "psychedelic" is used in a piece of music doesn't make the music itself "psychedelic," which is certainly the case with this song. I strongly suspect that Stampfel and Weber encountered the word as a result of the publication, earlier that year, of Timothy Leary's, Ralph Metzner's, and Richard Alpert's book, The Psychedelic Experience (New Hyde Park: University Press, 1964); whether they took its insights seriously is beside the point. A couple of years later, in 1966, excerpts from Leary et al. 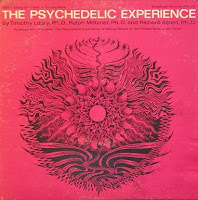 's The Psychedelic Experience were issued on LP as a spoken word album by Folkways/Broadside Records (album cover pictured), which I suspect was the first use of the word "psychedelic" on an LP record. Although it is of trivial significance, the first use of the word "psychedelic" on a rock/pop record was probably on the Deep's Psychedelic Moods, apparently issued in October 1966 (according the CD re-issue's liner notes) on Cameo-Parkway, just a week or two before the Blues Magoos' Psychedelic Lollipop (Mercury), and about a month before the 13th Floor Elevators' The Psychedelic Sounds of the 13th Floor Elevators (International Artists). Mercury is perhaps the only "major" label represented here. Gregory L. Ulmer has observed that any form of unconventional or radically new knowledge is at first perceived to be a bad joke--Freud's theory of psychoanalysis, for instance, and Darwin's theory of human beings evolving from monkeys were, in fact, both considered bad jokes. It is clear that popular music's initial appropriation of Leary et al. 's drug-enabled psychedelic experience--somewhat derisively referred to as "mind-expanding"--took the idea of a "psychedelic experience" as a joke: the deliberate mis-pronunciation of the word psychedelic as "psycho-delic" in "Hesitation Blues," for instance, or as evidenced by the titling of the Blues Magoos album as "Psychedelic Lollipop." Even referring to music as psychedelic (as in "psychedelic sounds") is a joke. Likewise, the records didn't sell well because they, too, were perceived as jokes. Indeed, the idea of the joke permeates early albums claiming to be psychedelic, for instance, Friar Tuck and His Psychedelic Guitar (1967), The Animated Egg (1967), Hal Blaine's Psychedelic Percussion (1967), and so on. It is clear that there are widespread misperceptions about what is often called "psychedelic music": how it was initially perceived, both by its audience and its practitioners, and about its subsequent influence. I find it strange that the psychedelic era is now popularly associated with San Francisco, even though the Deep's Psychedelic Moods was recorded in Philadelphia (and its brainchild, Rusty Evans--a pseudonym for artist Marcus Uzilevsky--was from New York), the Blues Magoos were from the Bronx, and the 13th Floor Elevators were from Texas. Moreover, I wonder if a majority of the members of the so-called "counterculture" ever perceived Timothy Leary as anything but a joke. I'm reasonably certain that "psychedelic," as a term used to described a certain type of rock music, had no credibility in 1967; in fact, at the time it was probably only used pejoratively. The word probably did not have any positive connotations in 1968 or 1969, either. Was it ever used positively at the time? Certainly not until it began to be used as a term through which individuals expressed their own desires, and began to identify themselves with the music and the culture surrounding it. In previous entries I've argued that what is called "Bubblegum" music emerged out of psychedelic music, and I think this is correct, but one has to remember that "Bubblegum" was not a term invented by those who liked and listened to the music, but those who disliked, and perhaps even despised it.